A Swearingen SA227-AC Metro III cargo plane force landed near Tampico Airport, Mexico, after running out of fuel. The aircraft departed Saltillo Airport at 21:27 on a non-scheduled cargo flight to Puebla, Mexico, carrying a total of 550 kgs of cargo. The captain was Pilot Flying, the copilot was Pilot Monitoring. Prior to departure the flight was supposed to have been refueled with about 2000 lbs of fuel. However, the flight took off without having been refueled and with just 700 lbs of fuel in the tanks. 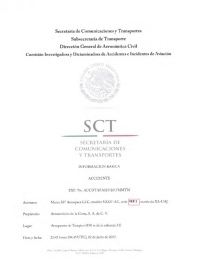 At 22:27 hours the flight declared a fuel emergency to the Mexico City ACC controller. The crew decided to divert to Tampico. Upon their request, the flight was cleared for an approach to runway 31. On final approach the aircraft hit trees and force landed, coming to rest about 850 meters from the runway threshold. "Emergency landing due to an inadequate pre-flight of the aircraft which resulted in the loss of power of both engines during the cruise flight due to exhaustion of fuel on board". 2. Lack of coordination between captain and operations officer during pre-flight preparation. Distance from Saltillo-Plan de Guadalupe International Airport to Puebla-Hermanos Serdán International Airport as the crow flies is 753 km (471 miles).